Use a bit of elbow grease if somethings actually dirty. Allow it to dry completely. If you are working on a really dirty or soiled piece of Teak get your steel wool and wet it with your Teak Oil. Lightly sanding with the grain the Teak Oil and steel wool will clean 99.9% of soiled areas. You can keep your windows closed: Good indoor Teak oil is not the smelly stuff used years ago. It is not toxic or flammable. 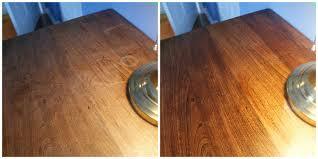 Apply Oil: Using a clean cloth, put the oil on the cloth and rub the oil on following the direction of the wood grain. Do not just pour Teak Oil directly on the surface and start wiping. When you pour oils on the furniture ‘sometimes’ the phone rings or you are called away and when you return you have a very dark oiled area. The puddle of oil saturated big spot on your furniture. You don't want pools of oil to stay sitting on any surface, so wipe it in and sop up any excess. It will stay shiny and sticky to the touch, so don't put anything back on top, allow the oil to be absorbed. Reapply Oil: If after an hour all the oil has been absorbed by the wood and you still can see dry spots, reapply the oil and allow it to dry. Let it Dry: I like to allow my final oiling to dry over a 2-4 hour period so that I'm sure it's all been absorbed. If you're finding that you used too much, wipe up the excess with a clean cloth. I've found that teak can absorb quite a lot of oil. Maintain: Now that your teak is shiny and new looking, make sure to use coasters under glasses, dust it frequently and try not to have it in direct sunlight as this will expedite fading and drying out.